By Melissa Lennig on September 23, 2013 27 Comments. This content contains affiliate links. As an Amazon Associate I earn from qualifying purchases. This past weekend, my family enjoyed the Apple Harvest Festival. As we were there, memories flooded my heart, as that particular festival was the first family event we took our oldest son to after my husband and I became parents 5 years ago! 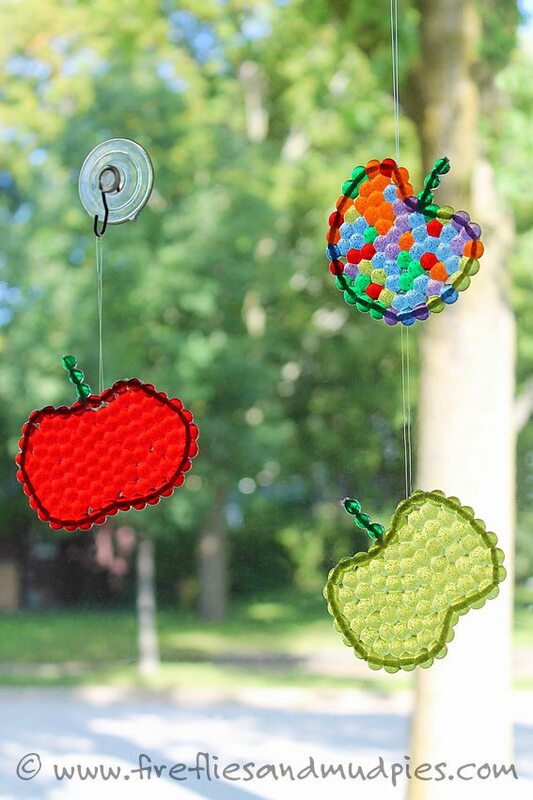 The next morning, the boys woke up to an invitation to create Apple Suncatchers. We needed something bright, cheery, and seasonal hanging in our home, and after a weekend of apple fun, it just seemed like the right kind of craft! 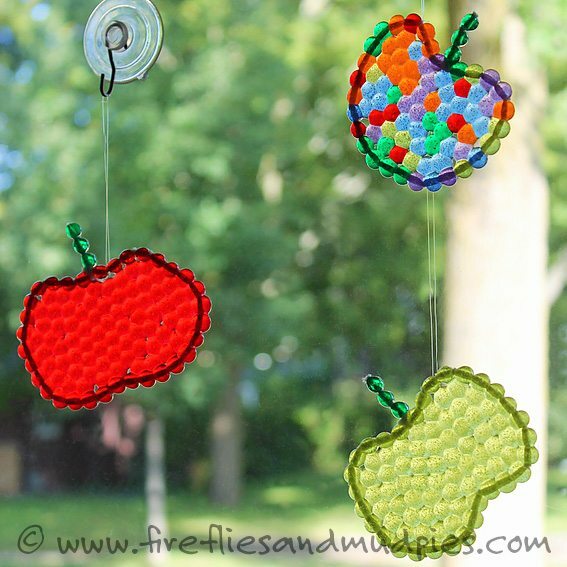 Apple Suncatchers are created using the same technique as the Rainbow Suncatchers that were shared on my blog this past February. 1. String 1 chenille stem with your choice of beads. 2. On one end of the chenille stem, string 3 green beads to create a stem. Bend the chenille stem into the shape of an apple. 3. Twist and tuck the ends of the chenille stems into each other to secure the shape of your apple. 4. 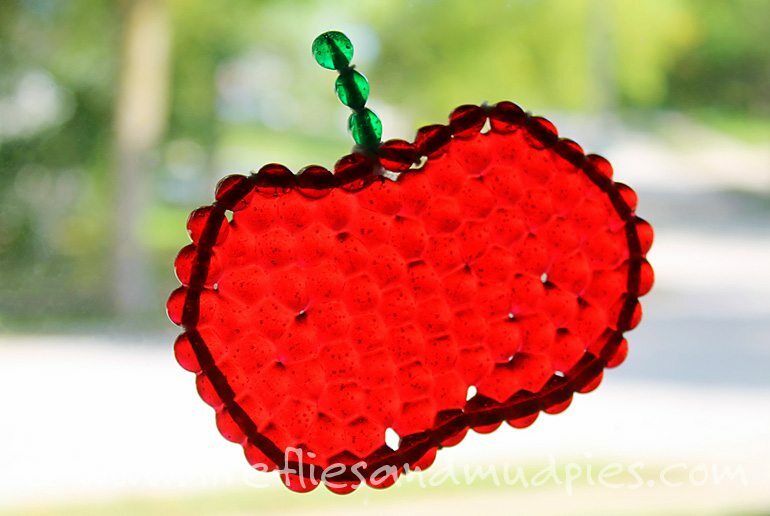 Place the beaded apple onto a parchment lined cookie sheet. 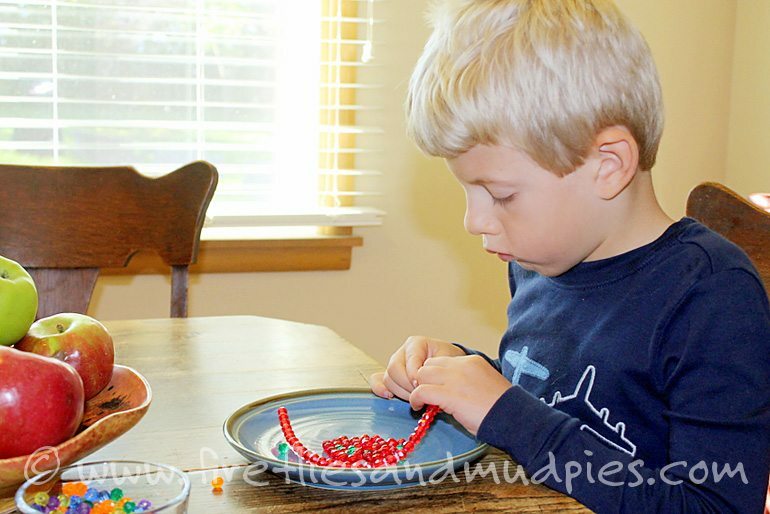 Fill in the entire shape with loose beads. 5. Place the cookie sheet into a cold oven and set for 350º. After the oven has reached the proper temperature, set the timer for 10 minutes. After 10 minutes, the beads should be fused together. Turn off the oven and allow the cookie sheet to cool inside of the oven. 6. When the suncatchers are cool, string a piece of fishing line through them. Hang and enjoy! 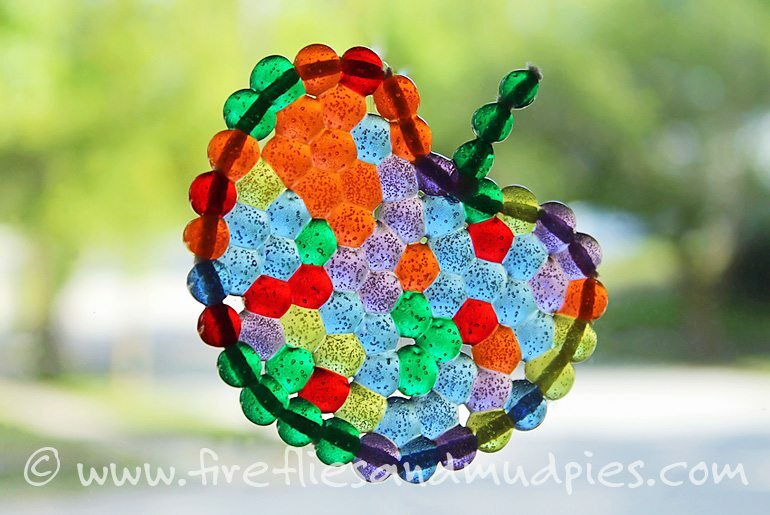 Of course we will have to make Jack-o-Lantern Suncatchers with this technique next! More kid-created seasonal decor for my home, and more fine motor practice for the kids!